If you want to get the most out of your money without compromising the quality and style, shopping for furniture at our resale store located in Broadview Heights Ohio, is your best option. One of the reasons our used furniture store is so popular is because we have a 7,000 square feet showroom stocked full of amazing deals. 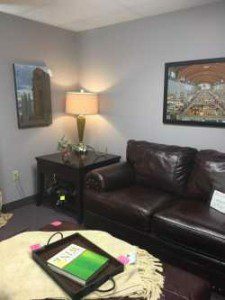 Our inventory of couches and chairs can change weekly. 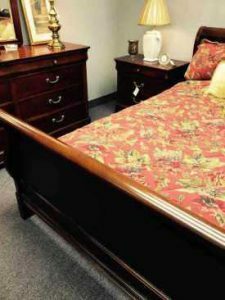 New used furniture comes in daily from our senior relocation and moving business in addition to people looking to sell furniture on consignment. Click Here to see more second hand couches. We only offer high quality and used couches and chairs that are in excellent quality. If you don’t find what you want in our warehouse showroom, then check out our online auctions. You can even visit our showroom to see the auction items in person before you bid. 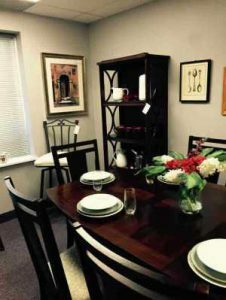 We constantly have used chairs, used upholstered chairs, dining room sets and kitchen tables coming into our resale store. The types of chairs we receive vary and sell quickly as they are a very popular type of used furniture people are seeking. When you visit to shop for quality used furniture, don’t forget to also check out our repurposed furniture store showroom that is located right next door. The showrooms are connected, so there is no need to walk outside to visit. Many of the older style tables we receive we send to our repurposed furniture store where skilled artists up-cycle the pieces into modern and chic pieces of furniture. All our second hand chairs and tables come from our senior moving and downsizing business. 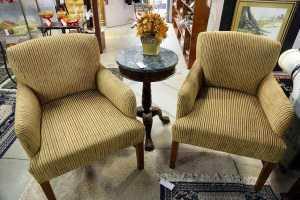 Some are also displayed as used consignment furniture. Bedroom furniture including bed frame and night stands are the most popular items we display for sale. Occasionally we receive full bedroom furniture sets. Click Here to see more second hand bedroom furniture. The dressers and dressing tables that are of an outdated design and style are sent to our repurposed furniture shop for a chic remake. Make sure you stop by often, follow us on Facebook or join our VIP notification list to receive instant notice of new used furniture pieces. Our used furniture pieces move quickly and sell on a first-come, first-serve basis. While we carefully inspect our used furniture prior to placing them on display for sale on our warehouse showroom floor, some products may have slight to moderate imperfections. We don’t repair these imperfections, so you need to carefully inspect the used furniture before making a purchase decision. All sales of used furniture are final.